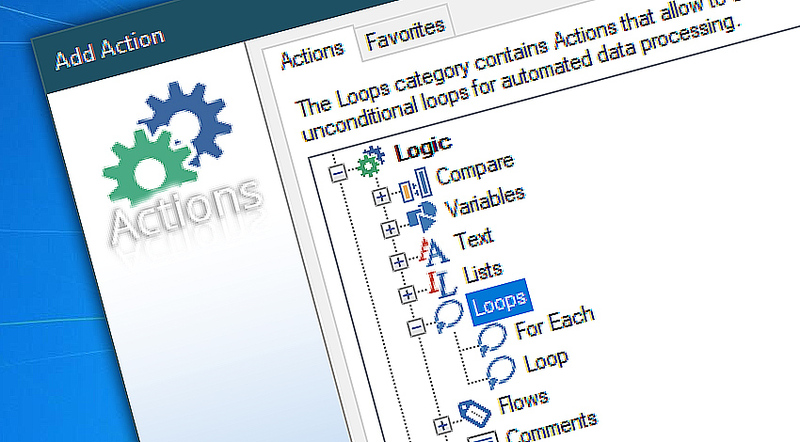 The Loop category features Actions that allow user to manage conditional and unconditional loops within a workflow. Conditional loops run until the specified criteria are met, e.g. text file parsed to the end. Unconditional loops run the specified number of cycles before stopping. All Actions contained within the loop are repeated at every cycle, automating one operation at a time. 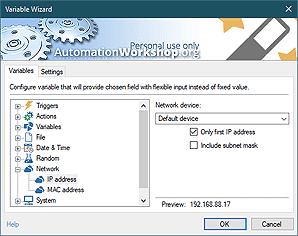 Loops typically repeat a part of workflow for multiple times. Each loop can contain any number of Actions that can be combined to create data processing of any complexity. E.g., the data from text file in every step can be parsed, cleaned up, properly capitalized, used to specify address and text while sending email and stored in a report file. When the loop completes, an Action outside the loop cycle can email the accumulated report to system administrator or store in backup. For each Action allows to create conditional loops that can parse text file or text string element by element and in each step perform an Action or series of Actions with that element as a operating parameter. Loop Action creates an unconditional loop with a number of steps that perform one or multiple Action in each cycle. The Action counts loop steps and increments or subtracts variable values by any value in each step. For each · parse text data element by element while processing each in a number of Actions. Loop · repeat one or multiple Actions within the loop for a specified number of times.